Vince Lewis is a veteran jazz performer, composer and recording artist. Since actively pursuing a solo career he has achieved national acclaim and airplay, as well as outstanding critical reviews in every major jazz publication. Vince has been a Heritage Guitar, Inc. performing artist since 1991, and a Benedetto Guitar artist since 2012, a Breedlove acoustic guitar artist since 2014 and an Eastman Guitars artist since 2015. He also performs and records with his signature Vince Lewis Model Ralston Archtop Guitar. He has recorded for Noteworthy Jazz, Redstone Jazz, Jim Martin Productions and also Vinbara Music. He has been a headliner with Dave Brubeck, B.B King, Ellis Marsalis, Lou Rawls, John Pizzarelli and Melissa Manchester. In 2012 Vince was recognized in the Jazz Guitar category as one of the “Leading Active Jazz Artists” by Jazz Inside Magazine. 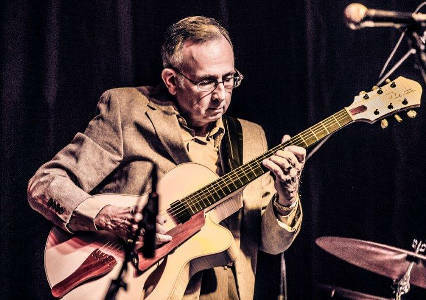 Jim Carlton, in Conversations with Great Jazz and Studio Guitarists says "His playing is indicative of the rarified air of true mastery. He routinely creates engaging and excellent music."